The Complete Fourth Season Blu-ray and DVD sets for Arrow became available last week and Warner Bros. Home Entertainment has provided us with a copy to review! All opinions are those of the author; spoilers for Season 4 are being discussed, so we’re assuming you’ve seen the episodes and are on the fence on whether or not to purchase it. The Episodes: Arrow Season 4 started out really strong. There’s a lot of teamwork and great character moments to kick off “Green Arrow,” and for the most part, the first half of the season is pretty darn good. There are a few speedbumps as it seems there were a few episodes earmarked to set up DC’s Legends of Tomorrow; also, it seemed unfortunate that there were three back-to-back revivals of characters who were either dead or thought to be dead, but Team Arrow wasn’t that angsty (aside from, you know, Laurel resurrecting her dead sister, Diggle being reunited with his, and the whole Thea bloodlust thing) but it pretty much worked. 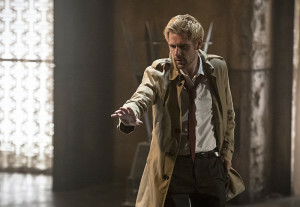 The Flash crossover was fun, but the best episode of the first half if not the entire season was “Haunted,” the episode that brought in Matt Ryan from the sadly-ended NBC series Constantine. It’s kind of hypocritical of me, in that I would prefer Arrow to return to its roots, but two of the best episodes this year were the installments bringing in magic-based characters John Constantine and Vixen. The flashbacks, aside from in “Haunted,” are honestly not very good, with no offense to any who worked on them. Thankfully, on Blu-ray or DVD you can skip right past, and be thankful the Bratva is coming in Season 5. The latter half of the season has its highlights, including the episode where a character dies (something hinted at from the start of the season). Watching that episode and the follow-up “Canary Cry” makes me wish that that particular character had gotten the kind of attention and screen time all along, because she really did a great job there. And then there’s the “Olicity” drama. Readers of GreenArrowTV know (and certain fans may hate the site because of it) that I’m not the biggest fan of the pairing. But here’s the thing: Arrow Season 4 started with a happy “Olicity,” and I didn’t mind it at all. Oliver and Felicity treated one another as equal partners in a relationship. Yes, there are little bumps, like the “idyllic perfect life” maybe not being what they both wanted or needed. But it was good. Then we got the baby mama drama in the crossover, and it just crashed. Oliver, you’re a big dummy for not telling her, but at the same time, the whole situation seemed like drama for drama’s sake. I also think Arrow missed a great opportunity to give TV fans a hero with a physical disability when Felicity had a magic cure for her paralysis. It’s a bit of a double-edged sword, because I don’t want Felicity to be Barbara Gordon 2.0 either, but I feel the show should have committed to it. But there’s a long rant, and I’m sorry you had to sit through that. Arrow had some good moments that year, but the Olicity moments after the crossover were usually not among them; at least not for me. I also wasn’t happy that the character who was killed, was the one who was killed, but what can you do? The show isn’t just being written for me, and I respect that. All told, though, there are some good episodes within, with some of the good action that you expect to see in the series (especially a sequence in “Brotherhood.”) And, again, I loved the episodes with good teamwork, when Green Arrow, Black Canary, Spartan, Overwatch, and Speedy could all work well together. Plus, Green Arrow’s new costume is cool. I should also shout out to guest stars like Tom Amandes who brought a lot to the show, as well as the always-great Katrina Law as Nyssa. The Extras: There are deleted scenes for several episodes, the best being a longer version of a Diggle/Thea scene in “Haunted.” Arrow has such assets in David Ramsey and Willa Holland that I’d always like to see them more. There are a number of extra features, and aside from the Comic-Con panel (more on that in a bit), I don’t think any actors aside from Neal McDonough are interviewed. That’s a little disappointing. There are two featurettes to tie in to the “Legends of Today/Legends of Yesterday” crossover — one with the Hawks (Hawkman and Hawkgirl), another focusing on Vandal Savage. 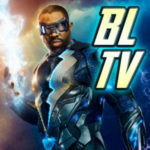 Talents like DC’s Geoff Johns and Dan DiDio talk about the characters, as do folks like VFX genius Armen Kevorkian and Executive Producers Andrew Kreisberg and Wendy Mericle. When I saw these announced, I figured they might be better suited for the Legends of Tomorrow set; as presented, I totally understand why they’re here. I will complain, though, that some of the exact same quotes from the interviews are used in both features, so at a certain point I felt like I was watching a rerun. Props to Andrew Kreisberg for mentioning that Kendra used to be a barista. I should add that the Flash episode of the crossover is included on this set. 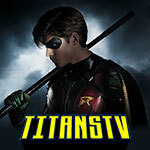 The set includes a featurette about Damien Darhk where writer Brian Ford Sullivan is also one of the people interviewed. 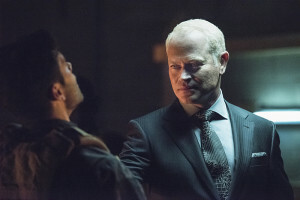 How much you like that depends on how into the Damien Darhk story you were. Neal McDonough is also featured in this feature. There’s a blooper reel, and I think I’ve seen enough of those that they stopped being as funny as they’re supposed to be. One of the cast members passing wind in costume was pretty funny, though. Finally, there’s the Comic-Con panel, or at least the Arrow portion of it. Stephen Amell makes a wrestling-style entrance in costume as the Green Arrow, and it’s pretty great. The “Olicity Supercut” that surfaced to promote the Blu-ray is nowhere to be seen, and considering how divided the fandom is over that aspect, that’s probably a good thing. Is It Worth It? In that there are certain episodes I liked and would like to see again in high definition, definitely. Your mileage may vary on the extras. I was disappointed there wasn’t a feature about the Black Canary, considering she was a major DC Comics icon and all, but we can’t always get what we want. I know I’m also a completist, and it’s really nice to have all four seasons of Arrow (so far) side-by-side on my shelf. Having such a nice cover with the new DC bullet doesn’t hurt at all, either. 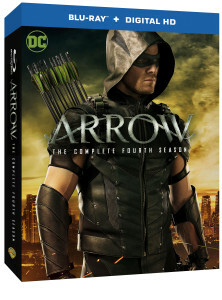 Arrow: The Complete Fourth Season is now available on Blu-ray and DVD. Order yours from Amazon.com and support KSiteTV!